Helping bring a Tiki Island state of mind to you! Tiki Island. The name evokes images of a tropical paradise, with graceful palms swaying in the gentle ocean breeze, sand sloping to meet the brilliant azure water reflecting the warm comforting sun, -and of course, those grand awe inspiring guardians, -the Tikis. Standing stately and erect, they stare with fierce, mysterious resolve at any who would dare intrude upon this most idyllic of worlds. Images of flaming tiki torches and garden statues (tikis of course) outside a thatched tiki hut slowly emerge from the swirling tropical mist. Even in the most mundane of circumstances, those images in the minds-eye can transport us to this place and give solace. It is my hope that this website, through sharing of ideas, images and plans, can help others experience this beautiful place, even if it is only through the power of their imagination, beliefs and expectations they carry with them every day. 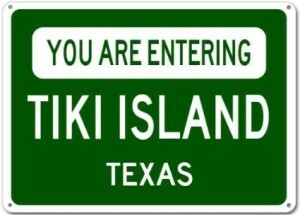 There really is a place named “Tiki Island.” It is Tiki Island, Texas. Located approximately 45 miles from Houston, it is just off the coast of mainland Texas, situated between Galveston Bay and West Bay. Galveston Island forms a barrier island, protecting Tiki Island from the waters of the Gulf of Mexico. Tiki Island, Texas is a small “resort-style” village within the county of Galveston Texas, where it is said that residents can “live year round and feel like you’re always on vacation.” It is a very small island of only 75 square miles, and has a population of approximately 1293, with approximately 850 homes. Fishing and golf cart races are just some of the many activities to be found there. There was even a Golf Cart Poker Run in May 2013! Tiki Island Real Estate offers opportunities for those who might wish to consider actually moving to Tiki Island, to create their Tiki Island Life. It is likely that there will be a good selection of Tiki Island Homes for sale. There were approximately 70 or so recently on the market, with a VERY wide range of price. For those not willing to take a plunge of that magnitude, there are always Tiki Island rentals to consider. There seems to be a good selection of rentals available generally in the form of houses and condos. They appear to be available mostly on Galveston Island. If you would like to experience Tiki Island vicariously, consider works of fiction on the topic. 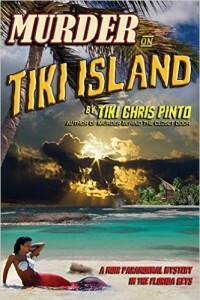 Tiki Chris Pinto (who by the way has an excellent “Tiki” website called “Tiki Lounge Talk”) wrote a book called “”Murder on Tiki Island.” It is a “Noir (dark) Paranormal Mystery in the Florida Keys.” It’s a great book (if you’re into the dark mysteries). It is a finely crafted story with interesting twists and turns, all in that classic “noir” style with a tough, seasoned cop, a drink or a few and of course “dames.” Since it is narrated by the main character, we get to be inside his head, a witness to his thoughts which are self-deprecating and intelligent, seasoned with thoughtful humor and insight. All in all, it’s a thoroughly enjoyable book. While you may want to read it fast because the story is so engaging, I would suggest you read it slowly because you will want the experience to last. 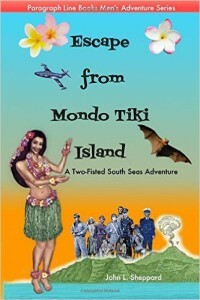 Another Tiki Island themed book is “Escape from Mondo Tiki Island: A Two Fisted South Seas Adventure.” This piece sounds like another wild adventure, sporting mad scientists and cybernetic chimps. It promises to be an incredible story, with wild, unusual characters and non-stop action. There are also other places that carry the name “Tiki Island.” Mostly they are amusement areas or parks or businesses that embrace the tropical “island” sort of theme. Unfortunately few of us can actually just go there, or live there. So it’s important, then, to discover how to bring about this Tiki Island Life in other, creative, imaginative ways. But first, let’s consider “why Tiki Island?” Well, the term “island,” for many, evokes images of a tropical paradise and a languid, relaxing lifestyle, -something comfortable, to be sought after, -a dream! Tiki, since before World War II, has been associated with the culture of the South Seas. Specifically, Tiki culture and Tiki Art emerged from Polynesia, -the relatively large area of the South Pacific forming a triangle with Hawaii, New Zealand and Easter Island (there are also island in areas referred to as Micronesia and Melanesia to the West-Northwest of Polynesia). There are many legends surrounding the origin of Tikis, many of which view the Tiki as “First Man.” They often held great religious significance, and in Hawaii represented specific gods. Regardless of their origin, Tikis seem to have established a firm hold on our imaginations and, like the term “Island,” evoke images of warm breezes, crystal turquoise water and palm trees, -Paradise! If we are interested in creating our own Tiki Island Life, obviously many of the things to think about involve appearance, -things to look at. Much of what is discussed in this website has to do with items to add to the environment to help create a certain look, decor or ambiance. There is more to it, however. Appearance, no matter how attractive or unusual, can become neglected, -taken for granted. 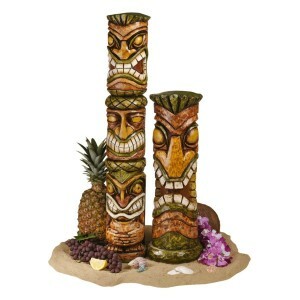 Making a Tiki Island Life is about more than putting a bunch of “stuff” around your house or yard. It’s a mental thing too. The psychological term for taking something for granted is “habituation.” We tend to take little notice of those things to which we have become habituated. It is a natural human response to stimuli to which we are repeatedly exposed. This often serves a therapeutic function. Consider jumping in a pool. At first the water is cold, but after a few minutes you don’t notice the cold, and may even perceive the water as warm. Consider also, those who live near a railroad track. Others may query, “How can you live here with the noise of the trains?” the response is almost always “we don’t even hear them anymore.” That is habituation. When this process results in taking things for “granted,” however, the results may not be quite so therapeutic. We may come to neglect things that once held great interest for us. This notion, then, of creating a Tiki Island Life becomes a matter of choosing, -choosing to direct the focus of our attention. When we direct our attention at any given thing, that thing becomes larger; it occupies more of our thoughts, and (if it is a positive thing) comes to be more appreciated. If, then, you are interested in the subject matter of this site, choose it, tend to it and nurture it, learn to appreciate the many details, the beauty and nuances of meaning. It is then, with the supplementation of some of the more tangible aspects discussed herein, you will truly be on your way to a Tiki Island Life.